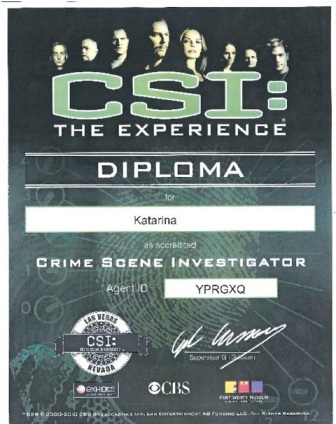 I attended CSI: The Experience at the MGM Grand in Las Vegas last May. In simple terms, it's an attempt to make the viewer a part of the show, in a way like the now-defunct Star Trek Experience at the Las Vegas Hilton, or the Star Tours rides at Disney's parks. As such, it beats the Star Tours experience all hollow, but doesn't quite match the Star Trek ride. As in the Trek ride, and unlike the Star Wars ride, several members of the cast appear in the attraction. The intro film is given by Gil Grissom, who will always personify CSI even if he's left the show. But unlike the Trek ride, you don't get to step into any of the show's sets. On the other hand, on the Trek attraction you're a passive observer, while on the CSI one you get to be an active participant. This is all to the good. To begin with you're assigned one of three crime scenes. For this you're given a clipboard, a pen and a piece of paper with your crime scene number on it. Then you watch the introduction, where Grissom gives you general tips and talks about what a Crime Scene Investigator (CSI, duh!) is supposed to be and do. I was glad to see Grissom again, by the way. Next you are assigned one of three crime scenes. I was assigned the one where a car has crashed through a house. It's called "A House Collided," in fine Grissom/CSI punster tradition. Inside the car there's a dead body. 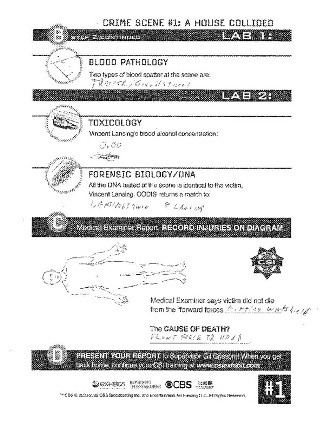 The paper you're given already has a basic sketch of the crime scene. You're supposed to observe and fill in some details of what you notice. If you miss something, you can go back to the scene as often as you want. There is no time limit to the attraction. Now, while having a detailed crime scene is a good beginning, having to view from beyond a rope line severely limits the immersion in the show. I understand the need. If you let people crawl all over it, the scene would be trashed, pretty much, every day. People would take stuff as souvenirs, damage the props, etc. But in the show the characters do crawl all over the scene, right? Oh, well. Think of it as a rare occasion where fantasy must bow to reality. In the TV show, too, the characters usually move from the scene to Doc Robbins' autopsy room. Not here. You move to one of the lab stations. 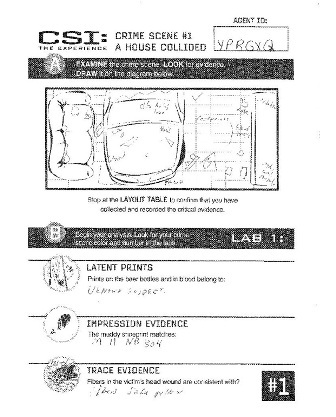 The paper with the crime scene sketch directs you to the next step, so that varies by scene. I visited the lab stations in the order suggested, but I suppose in the end it may not make a difference. Anyway, you get to see reports of DNA results, fingerprints, trace, etc. My scene had no ballistics, alas… The information is displayed on video screens, but there are also crime scene photos on display, some with close-ups, to put the evidence in context. If you get stuck, there's a help tab on the touch screen. I did get stuck once, as some DNA results seem to make no sense. But even before Nick Stokes came up to help, I recalled a crime scene detail that made the results sensible. But it was nice to see Nick, too. Other characters pop up in other stations. You'll also find some display screens with videos recorded by previous guests. In these videos people record their observations and give tips. There are a few monitors with cameras where you can record yours. I chose not to, nor did I watch many of these tips, but it's a useful feature. I suppose it would be best to record after you've solved the crime. The paper you were given has plenty of room for you to write down any observations from the lab stations, too. It can come in handy by the end, and even in subsequent lab stations. Next you visit autopsy, where Doc Robbins does indeed make an appearance. Next to Sarah Sidle and Gil Grissom, the avuncular medical examiner is a favorite of mine. I have to issue a minus point here, however. Doc Robbins appears on video, which is good enough, but the body being autopsied is a featureless dummy on which distorted, fuzzy views of an autopsy are projected. I don't like to see gory details, but the TV show does employ very specific imagery. You may recall older cop and/or doctor shows, like "Quincy M.E." or "Trapper John M.D." where you never saw the actual body or patient under the knife. The other difference between the attraction and the show is that you don't get to interview witnesses or interrogate suspects. It would be hard to have actors play the parts, and it would change the dynamics completely (which work fine as they are). But perhaps they should think to add an "Interrogation Station" where you can see Captain Brass question a suspect. Or perhaps simply add a video of witnesses giving their statements to other show characters. I don't insist this is necessary, but it would make the likely suspects more real. I kept forgetting to consider the pizza delivery guy, because he only got mentioned here and there in lab results. You never even see him. Once you have enough information from the lab stations, the autopsy and comments from the M.E., and your own crime scene observations, you're ready to present your findings to Gil Grissom. This is accomplished in the last room, where long tables sport several computers. You sit down, input the scene designation and your specific agent ID (also on the sheet you're given), and enter an interactive debriefing. The diploma is sent as a PDF file to your email, but you can pay extra to have it printed on site, and placed into a souvenir folder. I elected the cheaper option. I don't know what happens if you can't solve the crime to Grissom's satisfaction. I suppose you get to go back and try it again, perhaps. In conclusion, CSI: The Experience is a very nice, engaging and educational attraction. If you're a fan of the show, either the Vegas original of the Miami and NYC spin-offs, I'd say it is a must. If you're not a fan you can still enjoy it, but the touch imparted by the characters will be lost on you. Every day, 9 AM to 9 PM. Shows run every ten minutes. Price: $31.50 (including taxes and fees).